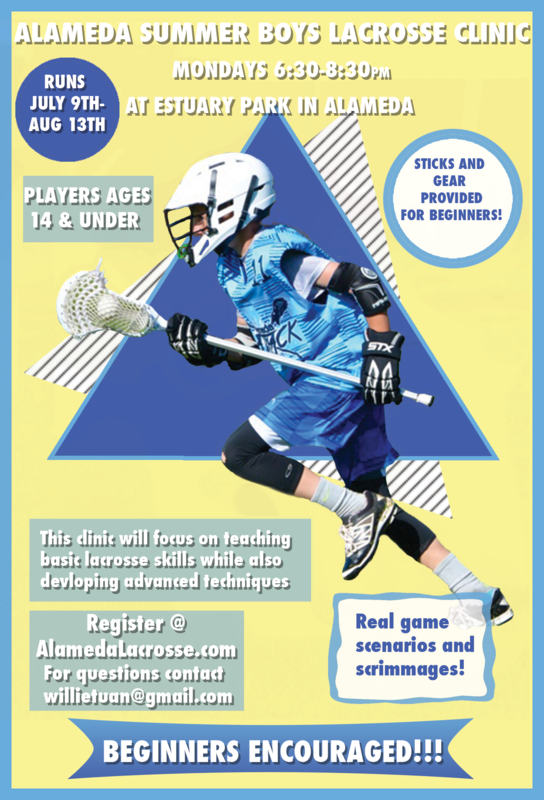 Summer Lacrosse Clinic | Alameda Lacrosse Club, Inc.
NEW — SUMMER BOYS LACROSSE CLINIC !! There will be a variety of drills and scrimmages focused on skill development for all experience levels. Summer Lacrosse Clinic is a great way to meet the coaches, learn basic stick skills and strategies. Sticks and gear provided for beginners. Introductory sessions available for first time players. Summer Lacrosse Clinic is a chance to get out your stick, freshen up your skills, and connect with friends. SUMMER CLINIC runs July 9 - August 13 (every Monday) from 6:30-8:30pm at Estuary Park in Alameda. Registration is open to ALL PLAYERS AGES 14 AND YOUNGER. Players will be grouped by age and ability, ensuring they get a challenging and safe experience.